Are you considering living in Netanya? Netanya is located in the northern part of the Central District in Israel, in the plain of the Sharon. The name Netanya means "gift of G-d". With easy access to the main railway and an extensive bus service, Netanya is an ideal choice for people willing to do a half-hour commute to Tel Aviv in the south, and a similar commute to Haifa, in the north. Nearly 200,000 residents call Netanya home. Netanya is popular among immigrants from France, the Former Soviet Union (FSU), Ethiopia, Persia (Iran), the English speaking countries and South America. In fact, about 1/3 of Netanya's residents are immigrants. Industry in Netanya is largely divided between four industrial parks - hi-tech and tourism play a major part in Netanya's economy and offer numerous employment opportunities. There are also many employment opportunities in the various academic institutions, the hospital and of course at Ikea which operates a very popular store in the area. Netanya's small and medium business, shops and shopping malls all offer a wide selection of jobs and employment as well as for English speakers. Buses, railway and sheruts (shared taxis) connect Netanya with other parts of the country. Two train stations; Netanya station and Bet Yehoshua station operate direct trains to Tel Aviv, Binyamina, Hadera, Herzliya, Lod, Rehovot, Ashdod, Ashkelon and other towns. All Israel Railways stations, including Ben Gurion Airport, can be accessed from Netanya via transfer stations such as Binyamina and Tel Aviv. You can choose to rent or buy an apartment, cottage or villa. Depending on the location, the starting purchase price for a new 4 roomed apartment (3 bedrooms) is around 1.2 million shekels. Rentals average at 3,000 shekels for a two bed-roomed apartment and can fetch up to 5,000 shekels per month for a four bed-roomed apartment. You can expect to pay at least 3 million shekels for a cottage and obviously, even more for a villa. Popular suburbs include the Nitza and South Beach areas which are especially popular among English speaking seniors. Kiryat HaSharon and Ramat Poleg are also popular choices. 186 kindergartens, 46 elementary schools, and 16 high schools are controlled by the municipality's education department with a large selection of secular schools as well as schools for the Dati Leumi community. Bet Yaakov and Chabad also have education facilities. Higher education in various fields is offered at The Netanya Academic College, The Ort Hermelin College of Engineering, the Zinman College of Physical Education and Sport Sciences, Lesley College, and The Tesler School for Nursing. Also The Wingate Institute, Israel's National Center for Physical Education and Sport are located in and around the city of Netanya. All four of Israel's health-funds: Maccabi, Clalit, Meuhedet and Leumit are represented and have branches and clinics in the city. The Laniado Hospital serves almost half a million people residing in the Netanya, Sharon region and its surrounding settlements. The Tesler School for Nursing is affiliated to the Laniado Hospital. Around 200 synagogues of all sizes and all affiliations; Ashkenazi, Sephardi, Orthodox, Ultra-Orthodox, Reform etc. You are bound to find a shul with a mix of people and a level of observance you feel comfortable with. Netanya has 5 malls; Hasharon Mall, BIG Poleg, Hadarim Mall, HaIrusim Mall and the Poleg Mall. There are 100 shops and offices; clothing stores, restaurants, coffee shops etc. This shopping area is divided into 2 sections. One of the sections is designed around a central, open parking area. The second section is in a closed mall. 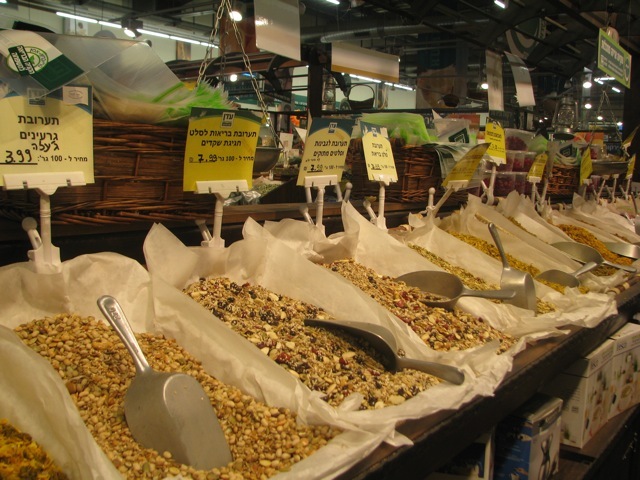 A noisy and colorful place, one of the greatest features of the shuk (market) in Netanya is that it has a roof; summer or winter, pounding rain or the intense summer sunshine, the entire shuk experience is much more pleasant because of this. Like any other market fruits, vegetables and meat, spices, deli are available. Exotic aromas and everything you could want for North African, Russian or French cuisine. Lots of small restaurants with a varied menu choice and highly recommended to have a meal at the Tripoli restaurant. The center of the Netanya Market is located on Shoham Street. The Netanya Market is open on Sundays – Thursdays from the morning and until the afternoon and on Fridays until early afternoon. Cheaper prices late in the afternoon just before closing and on Friday as well. Sand-stone cliffs and 13km of nine sandy public beaches make up Netanya's golden coastline. Pleasant and warm for most of the year, the official swimming season is from June to September . Lifeguards are on duty from early morning to sunset. Near the Blue Bay Hotel - is Netanya's most northerly beach. Unfortunately this beach is currently closed to the public. Midday hours: Sundays, Tuesdays, and Thursdays, from 13:30 and until half an hour before sunset. Midday hours: Mondays, Wednesdays, and Fridays from 13:30 and until half an hour before sunset. The beach is closed on Saturday. Near the Onot Hotel, access from Niza Boulevard and the Shaked promenade, the Onot beach is frequented by youngsters who love music and dancing. 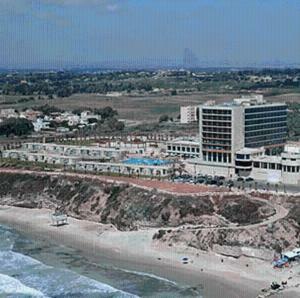 The Amphi Beach is situated right by Netanya's amphitheater. If you are into water sports, this is the beach for you. There is beach access for boats, surfboards and kayaks. There is a marine sports club and a diving shop where you can sign-up for diving lessons. Herzl Beach - off Herzl Street and Atzmaut Square is adjacent to Amphi Beach - playgrounds, a restaurant, beach umbrellas. a sports center, sports equipment rental and a special camp for children are some of the reasons to come to the Herzl beach. The beach is also accessible through the Sea Elevator and there is parking on the northern side of Sironit Beach. A special thumbs-up - Herzl Beach also provides handicap accessibility. Salsa dancing, Israeli folk dancing, creative activities and sports competitions, beach football, and beach volleyball are just a few reasons to hang-out on the Sironit Beach. Adjacent to Herzl Beach, the two beaches share the same facilities.The lifeguard station is opened all year long, including the winter season. Netanya's main beach and voted as one of Israel's top 10 beaches, Sironit Beach is located below the Rishonim Promenade, accessible by the transparent sea elevator. Two breakwaters are set up opposite the beach which create tranquil bays and enable safe swimming almost all year round. neighborhoods of Neot Shaked and Ramat Yadin. The beach is narrow and beautiful and there is no wave breaker here. The beach is accessible on foot from Sironit Beach or Poleg Beach. The city's southern most beach, "Speedo" Poleg Beach is situated next to the Black Iris Reserve and Ramat Poleg. The beach has a gourmet restaurant, buffet, changing rooms and restrooms. Motorized sea craft are permitted only in the northern zone. There is a fee for parking.